At time of writing, we are still in the dissipating wake of another mass shooting in the United States, this time in a Parkland, Florida, high school. The American people are once again reminded of the ubiquitous threat of violence that characterizes their everyday lives. We are once again confronted with the nauseating reality of a two-party system that defends this violence in word and deed—while providing rhetorical paeans to security, freedom, and safety. The horrors of seventeen dead children may justifiably capture the headlines and occupy the rhetoric of politicians bought by gun manufacturers and the National Rifle Association (NRA) for a few days—maybe even a week or a month—but there is almost no chance that the deeper violence that constitutes our society will receive much attention. Thus far, with few exceptions in independent left media, this is exactly what has occurred. What is typically missing from the often-well-justified slogans that characterize the typical responses to gun violence is a connection back to a broader critique of the violence inherent to capitalism. 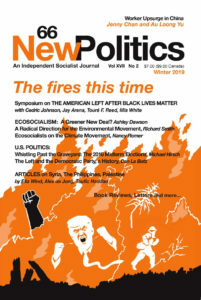 Part of the inability of the left, particularly the liberal left, to connect these various responses to a broader critique of capitalism and its inherent, direct, and structural violence is the refusal of many on the left to appreciate that socialism, and even a watered-down social-democratic welfarism, is best understood as a kind of pacifism. Now, before you call me a liberal idealist with no appreciation for the violence experienced by those who are most egregiously exploited and oppressed by capitalism, for the historical effectiveness of tactically deployed violence in various anti-colonial struggles, or for the potential need to use violence in a revolutionary context to prevent the reemergence of capitalism—hear me out. While there is something lost in saying “socialism is not pacifism,” just as much confusion is produced if one claims the opposite, that socialism is pacifism. Socialism is not liberal pacifism, nor is it a tradition that opposes the use of necessary violence in self-defense.2 While this is certainly a complicated theoretical and practical distinction, it is one worth highlighting. Capitalism is violent. The police, military, prisons, and under-regulated corporations conspire to enforce exploitative wage-labor relations and do seemingly as little as possible to actively protect workers, immigrants, people of color, gay people, trans people, or women from the incidental violence produced as a result. The juridically reinforced lack of access to high-quality, affordable health care is a kind of violence. Similarly violent are the “right to work” laws that undermine the effective labor organizing needed to ensure that workplaces are free of danger, harassment, and discrimination. Even the more obvious violence of imperial warfare perpetrated by the United States and its NATO allies around the world, at great profit to weapons manufacturers, has deep structural elements that more or less ensure its continuation. Socialism opposes (capitalist) violence. Socialism opposes structural forms of violence including systemic deprivation and exploitation, the direct violence deployed to defend these structural forms (like police violence and war), as well as the indirect violent consequences of structural violence (such as drug addiction, intimate partner violence, suicide, and working-class “crime” more broadly). Socialism much prefers the use of nonviolent resistance and organizing (for both ethical and strategic reasons), but its adherents acknowledge that defense against the violence of capitalism could require, and historically has required, violence to prevent further increases in violence (both direct and structural). Put more simply, if capitalism were nonviolent, socialism’s tactics would be too. The reality is that capitalism is inherently violent, both structurally and in that it requires direct violence to maintain itself. Socialism, on the other hand, aims to minimize all forms of violence. The goal of socialism is a pervasively nonviolent world, achieved primarily—though not necessarily exclusively—through nonviolent means, thus making it a unique form of pacifism. There are two dimensions to this pacifist interpretation of socialism. First, and less controversial, is that socialists oppose all of the various forms of violence (re)produced by and through capitalism: workplace violence; sexual violence; police violence; war; pollution; devastating super storms driven by climate change; and lack of access to affordable housing, health care, healthy food, or leisure time to maintain one’s physical and emotional well-being—deprivations that can only be mitigated by acceding to the functional but precarious wage-labor market. Socialists aim to build a world where these forms of violence simply don’t exist. While well-meaning socialists can disagree about the best processes to achieve such a society, or the specific institutional or organizational arrangements to maintain such a society, that the goal of socialism is to create a world beyond the violence of global capitalism should be beyond dispute. The second pacifist dimension of socialism gets into the means of achieving a democratic, egalitarian society beyond capitalism. Because socialism is fundamentally rooted in the equal worth of all people and everyone’s right to live a decent life free of oppression and exploitation (tied to the prohibition that no person or group can oppress or exploit others), direct and structural violence are antithetical to socialism. This is not to say that violence exercised in self-defense is antithetical to socialism, or that the violence of the oppressor is the same as the violence of the oppressed. Quite the opposite is true. Socialists recognize the potential practical justification for defensive violence. The oppressors’ violence is unjustifiable because it is exercised in defense of violence. The violence of the oppressed, exploited, or otherwise threatened is only possibly justifiable in strategic terms if it is aimed at lesser—and eventually the abolition of—violence. Self-defense or practically grounded emancipatory violence is aimed not at the destruction of life, but in the defense of life. The question of when it makes sense or is justifiable to engage in this kind of violence can only be answered through praxis—through strategic and tactical decision-making rooted in the broader interests of the socialist project, itself aimed at a nonviolent world. Resistance to this violence of capitalism is unlikely to succeed primarily by counter-violence. For this reason, combined with consciousness-raising effects, socialists prefer nonviolent struggle (for instance, organizing, intervening, marching, protesting, running independent candidates in elections, and various forms of civil disobedience). Beyond contributing to an otherwise merely theoretical debate, what is the payoff of thinking of socialism as a kind of pacifism? By thinking in terms of pacifism, socialists are able to name their enemy, as well as the reason that that group or class is their enemy, explicitly and simultaneously; the enemy is the violence perpetuated by the capitalist system, the capitalist class, and the capitalist state (especially its police and militaries). They are the purveyors of the violence that comprises life within contemporary capitalism. When we think about anti-union legislation, for-profit health care, imperial warfare, police violence, intimate partner abuse, or even school shootings, the broader critique of violence offered by a theory of socialism as pacifism points us more readily to potential solutions. That is because this thinking gives us greater capacity to analyze the constitutive structures of violence, which are also often the roots of the too-often individualized instances of direct violence. The Marjory Stoneman Douglas High School shooting was a violent manifestation of a violent system that (re)produces a violent society. Nikolas Cruz, the confessed shooter, only 19 years old, was raised surrounded by violence and inadequate social care. He was overlooked by underpaid and overworked social workers. He was failed by underpaid and overworked teachers and school administrators. He was failed by overpaid and underworked politicians and executives of gun manufacturers, who ensured that an eighteen-year-old with a documented history of violence and mental illness could still buy an AR-15. He was failed by the president and by the Republican Party, which has repeatedly defended bigotry, sexism, xenophobia, anti-Semitism, and White supremacy. He was failed by a society that defends, normalizes, and promotes toxic masculinity—which the #MeToo movement and women’s marches have again have again drawn attention to. And if Cruz was failed in all these ways, his victims have been failed immeasurably more; they paid for these failures with their lives. All of this is violence that is structurally reinforced, if not caused, by capitalism. More aggressively taking up the mantle of nonviolence is both a theoretically justifiable and a rhetorically powerful tool for socialists. Pacifism has been castrated by the hypocrisy of a liberalism that refuses to acknowledge either the complicity of existing institutions in mass systemic violence (reserving “pacifism” exclusively to the realm of individual acts of civil disobedience) or, more broadly, the inherent violence of the existing order itself. By being unafraid to re-appropriate the word and tradition, we gain a greater capacity to point out those contradictions without surrendering the strategic or ethical high ground to inadequate, incomplete, or unrealistic discourses of nonviolence deployed in defense of a system of violence. 1. On the relationship between racism and gun control, see here and here. 2. For two iterations of this argument, see: Jonah Birch, “Are socialists pacifists? Aren’t some wars justified?” in Bhaskar Sunkara, ed., The ABCs of Socialism (Verso/Jacobin, 2016) and Tom Crean, “Is Gun Control the Solution to Gun Violence: A Socialist Analysis,” Socialist Alternative (2012, updated Dec. 17, 2017). 3. For an informative primer on theories of structural violence, see: Johan Galtung, “Violence, Peace, and Peace Research,” Journal of Peace Research (1969); the New Political Science symposium, “Revisiting Johan Galtung’s Concept of Structural Violence” (June 2012); and Marc Pilisuk and Jennifer Achord Rountree, The Hidden Structures of Violence: Who Benefits from Global Violence and War (Monthly Review Press, 2015). Further, on the specifically genocidal violence of capitalism, see Garry Leech, Capitalism: A Structural Genocide (Zed Books, 2012). Bryant William Sculos holds a PhD in political theory and international relations. He is currently a postdoctoral fellow at The Amherst Program in Critical Theory, adjunct professor at Florida International University, contributing writer for the Hampton Institute, and Politics of Culture section editor for Class, Race and Corporate Power. Bryant is also a member of Socialist Alternative-CWI in the United States.